Marshall M. Fredericks Sculpture Museum | "American Eagle (Ann Arbor War Memorial Eagle)" Close-up of front view. Madison High School. Madison Heights, Michigan. "American Eagle (Ann Arbor War Memorial Eagle)" Close-up of front view. Madison High School. Madison Heights, Michigan. 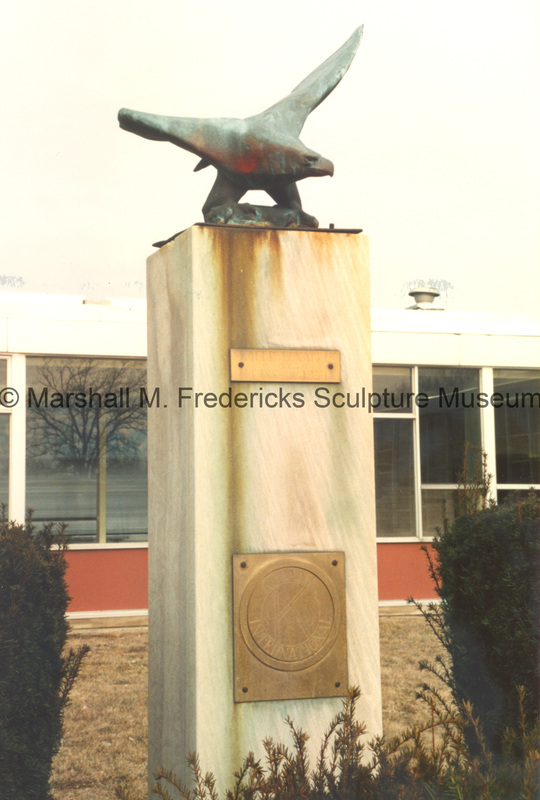 Close-up of front view of bronze eagle sculpture on a pedestal at Madison High School in Madison Heights, Michigan. This sculpture is a small-scale version of the war memorial found at the University of Michigan Stadium. “"American Eagle (Ann Arbor War Memorial Eagle)" Close-up of front view. Madison High School. Madison Heights, Michigan.,” Marshall M. Fredericks Sculpture Museum, accessed April 21, 2019, http://omeka.svsu.edu/items/show/18.